Public-spirited volunteers turned the tide of damage inflicted on Cockenoe Island last year by Superstorm Sandy, making the off-shore preserve accessible to camping again. 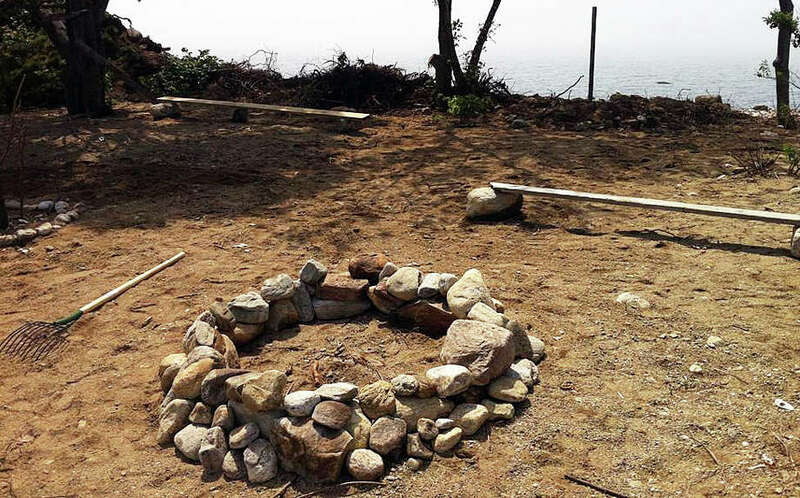 Camping was banned on the island in the spring after the four campsites were still littered with debris swept in by Sandy's surging tides and wind, fire pits were reduced to rubble and rocks were strewn across the sleeping areas. "People really love this island and all were anxious to get it cleaned up and ready to go for another camping season," Alicia Mozian, conservation director, said last week. "We're a beach town, and that's been a pastime for generation," said Brandon Arias of Westport, one of a dozen volunteers who gave time to help get things fixed up. Four separate trips were made by volunteer cleanup crews to the island over the last month, Mozian said, with some employees at Town Hall donating their time on off hours. "It was good to give back to the community and help out," said Arias, who added there was a lot of hard work needed to get things ship shape. "There were rocks that needed to be moved, pitch-forked and raked out of the way." Hundreds of pounds of organic debris -- sea grass and seaweed -- was collected and disposed of through one of several controlled fires, which were supervised by personnel from the Fire Department. "I think campsite No. 1 took the biggest pounding," said Todd Reichhelm, noting that the storm hit it squarely on that side of the island. "It completely changed the topography of it." He noted that a quantity of the organic debris was also dragged back into the woods. "It's probably better to do that and create some topsoil for the island," Reichhelm said. Mozian said this spring has been a productive year for threatened and endangered birds that nest on the island's westerly spit. She asked that those visiting stay away from the spit on the western side of the island to avoid disturbing the eggs or fledgling birds. Volunteers from Connecticut Audubon and the National Fish and Wildlife Service may be on hand from time to time to monitory the birds. "I have also learned from the U.S. Fish and Wildlife Service, which monitors the island for threatened and endangered bird populations, that as of June 27, Cockenoe had 40 pairs of common terns with 50 hatchlings," Mozian said. "This is a huge increase in the population. Part of it could be that the spit grew taller during Sandy and created a larger habitat area. "Protection of these birds was another reason why I decided to hold off on opening camping until after the (July 3) fireworks." "I've grown up here my whole life and I've spent a lot of time out there," Reichhelm said, noting that his children enjoy trips to Cockenoe in their boat. "It's a great place. ... Camping out there is great." For something so close to Westport, he said, it's amazing to feel like you're so far away.